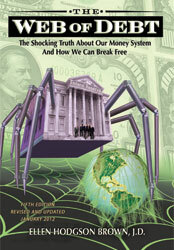 Web of Debt — Ellen Brown writes: Cyprus-style confiscation of depositor funds has been called the “new normal.” Bail-in policies are appearing in multiple countries directing failing TBTF banks to convert the funds of “unsecured creditors” into capital; and those creditors, it turns out, include ordinary depositors. Even “secured” creditors, including state and local governments, may be at risk. Derivatives have “super-priority” status in bankruptcy, and Dodd Frank precludes further taxpayer bailouts. In a big derivatives bust, there may be no collateral left for the creditors who are next in line. This entry was posted on Thursday, April 18th, 2013 at 7:45 am	and is filed under Crisis, DANGER, Economics, The Internet. You can follow any responses to this entry through the RSS 2.0 feed. Both comments and pings are currently closed.